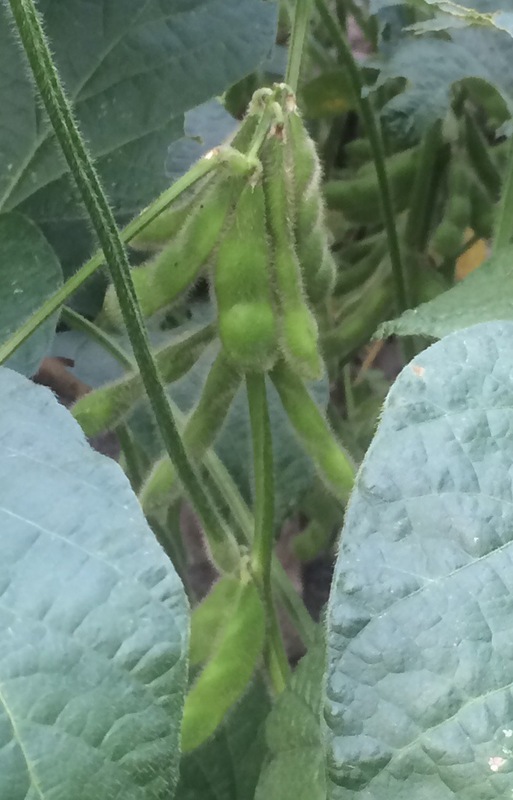 I picked up some organic green beans from Tap Root Farm at the farmers market. 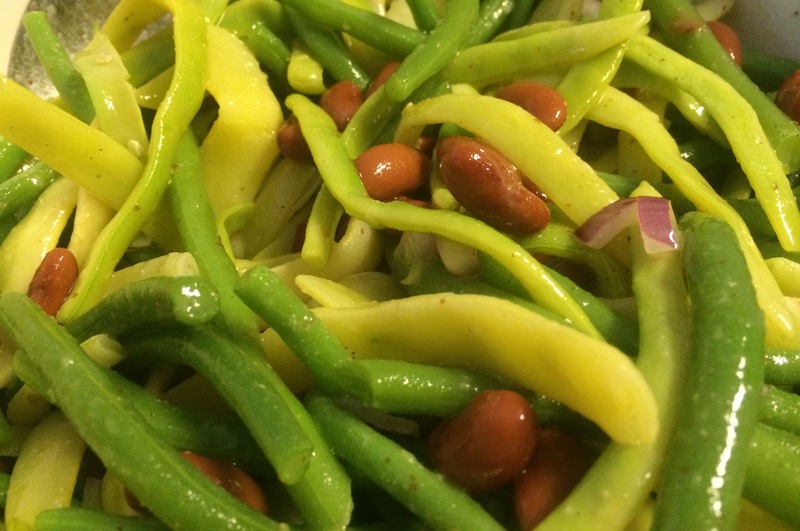 Mix up a dressing of olive oil, vinegar, lemon juice, stone-ground dijon mustard, seas salt and pepper, and add the cooked beans and some kidney beans and you have a tasty summer side salad. I also picked up some nectarines at the farmers market to make a nectarine upside-down cake. It was delicious both as a dessert and as a breakfast treat. Bring a large pot of water to boil. 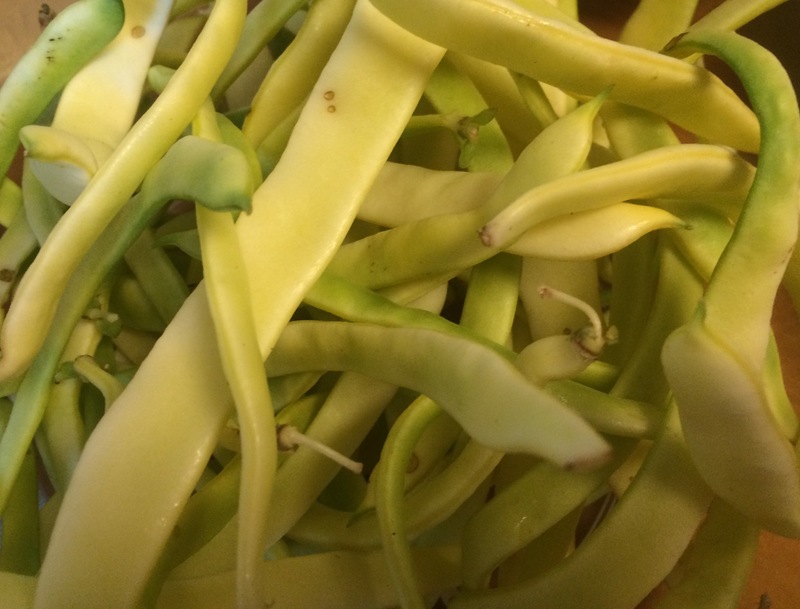 Cook the yellow and green beans until tender, 5 – 7 minutes. Drain and rinse under cold water. In a large bowl, whisk together the olive oil, vinegar, lemon juice, salt and pepper. Add the cooked beans, kidney beans and red onion, toss well. We rarely eat red meat, or dishes that are focused on the meat. But tonight was different, ground beef (grass-fed) would be front and center in the keema. But don’t be fooled, it is not just meat and peas, keema is filled with foods from my garden – tomatoes, garlic, and hot pepper. 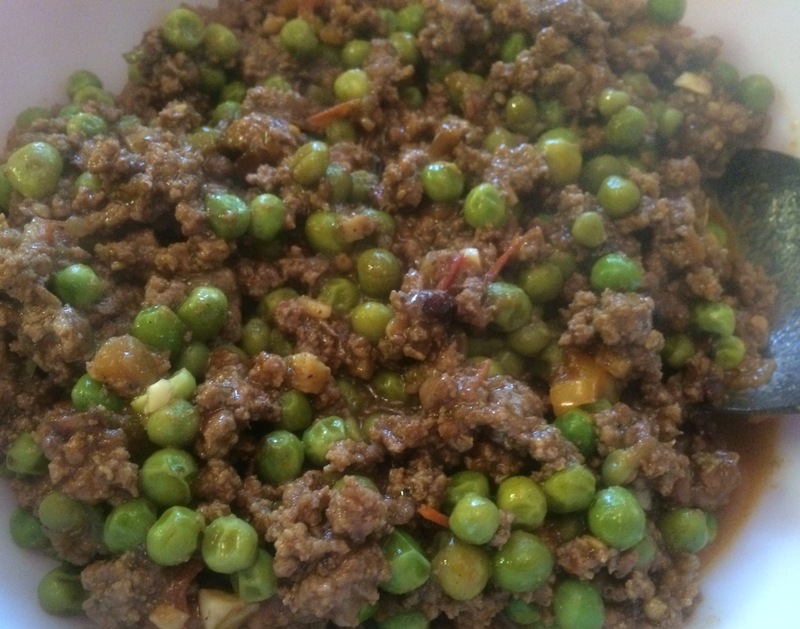 I first had keema last summer when an Indian friend of mine brought it to a pot luck. 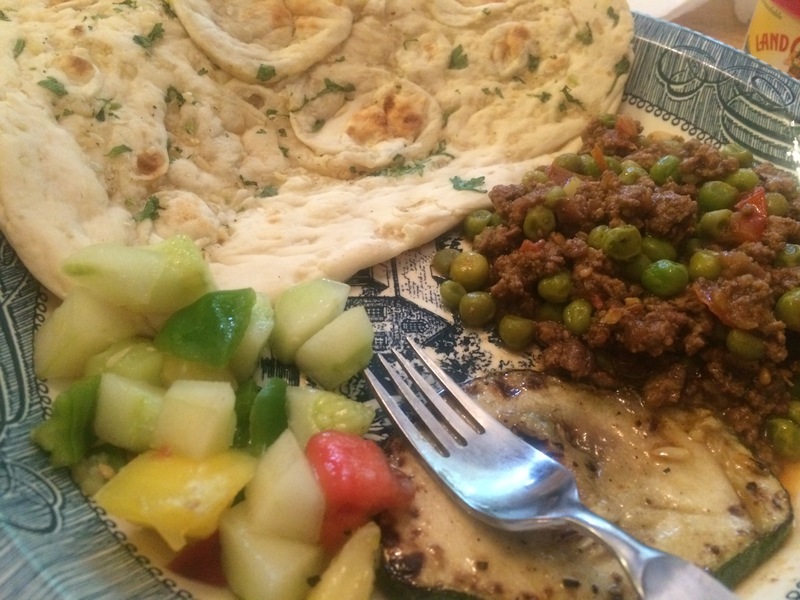 I was immediately hooked, and very happy when I found a Padma Lakshmi recipe that recreated the yummy goodness of Nafeesa’s dish.Here is my adaptation, which we ate with garden-grown pan-seared okra, pan-seared pattypan squash, salad, and of course, some garlic naan. In a nonstick skillet set over moderately high heat, warm the oil until hot. Add the onion and cook, stirring occasionally, 5 minutes. Add the beef, salt and pepper to taste, and cook, stirring, until no longer pink. Add the garlic, tomatoes, gingerroot, Garam Masala, and chilies, and cook, stirring, for 5 minutes. Add the peas and continue to cook over moderate heat, stirring occasionally, for 10 minutes more, or until flavors blend. Stir in the lemon juice and cilantro and correct seasoning, adding more salt if necessary. Serve with warm rotis, naan, or tortillas and spoon Keema down center of bread and roll up like a burrito. Enjoy! We have been in a bit of a shrimp kick this summer. Wild caught gulf shrimp, it may not be local, but it is certainly good. My goal is to combine the shrimp with food from my garden. 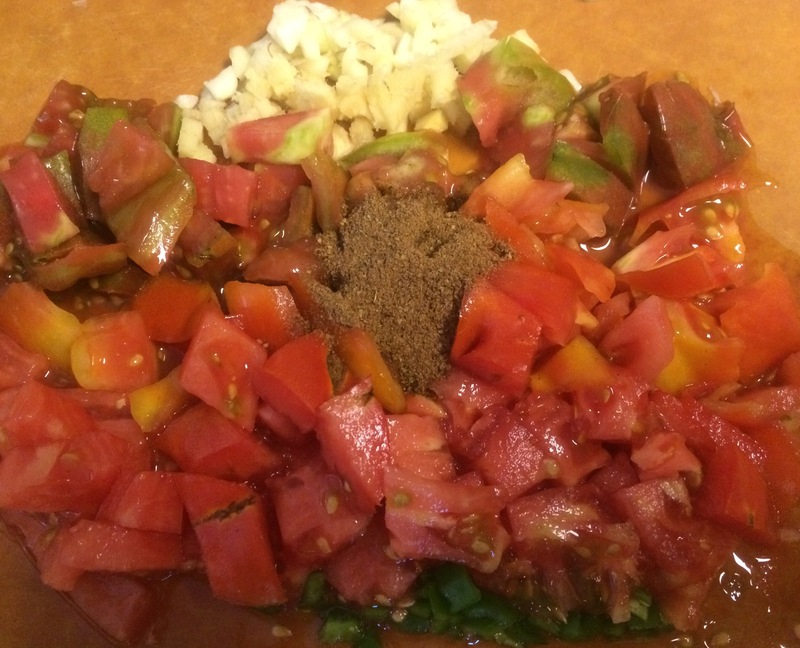 Today it is my basil, garlic, and tomatoes. 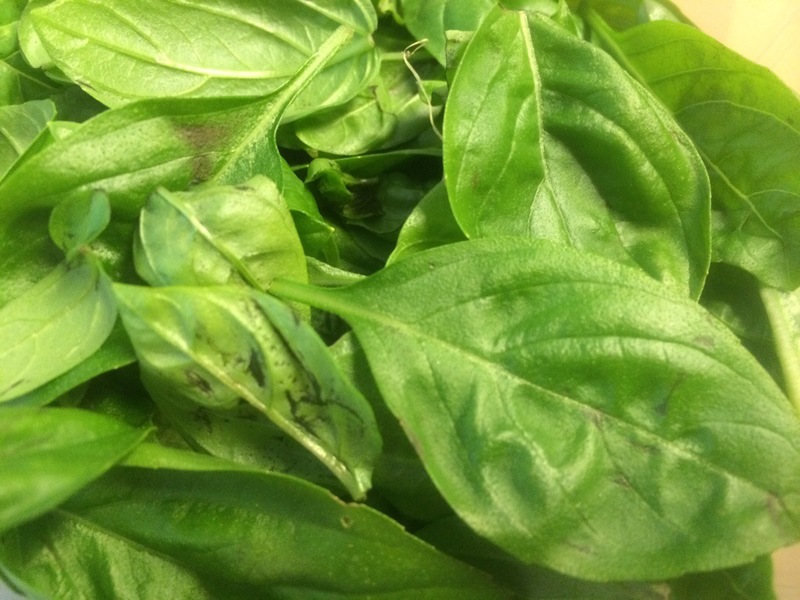 Oops there is a bruised leaf in my picture – don’t worry, it did not make it into the pesto. 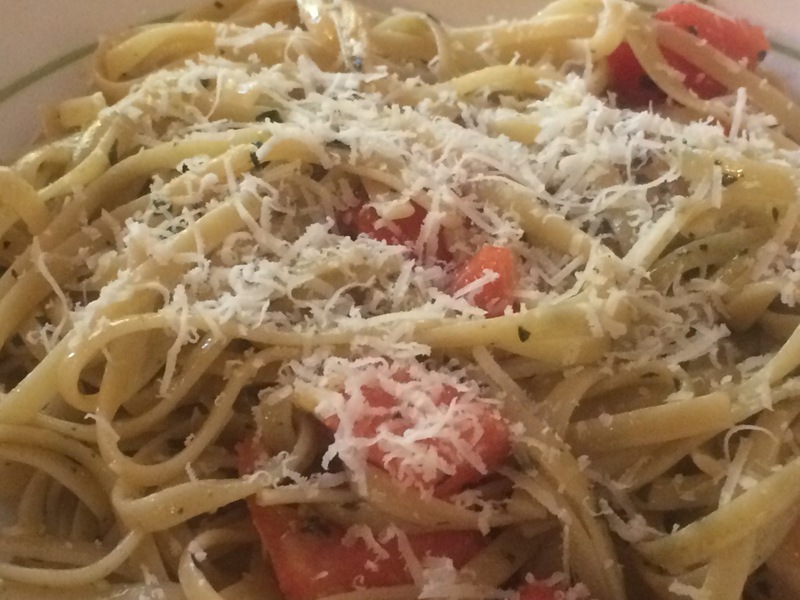 I love the combination of pesto and fresh tomatoes. The tomatoes brighten up the pesto and the pesto brings out the flavor in the tomato. Instead of just searing the shrimp, I cooked it in a little bit of garlic and olive oil. That may be the key to this whole dish – the shrimp could have carried the day on their own. 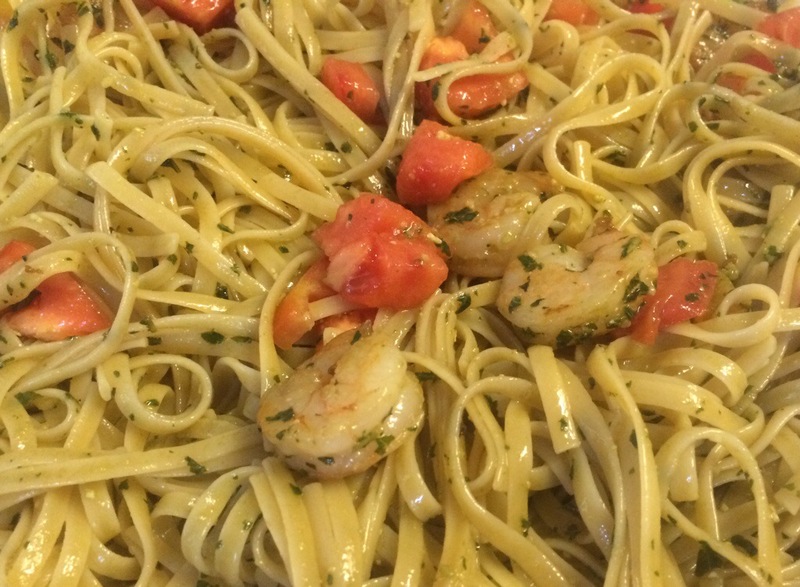 But the combination of the shrimp, pesto and fresh tomatoes made for a near perfect topping for the linguine. All it needed was some freshly grated grana padano (or parmigiano reggiano). Meanwhile, heat the olive oil in a skillet over medium-high heat. Add the garlic and cook until fragrant, about 30 second – 1 minute. Add the shrimp, cook and turn after 2 minutes. Cook for another 2 minutes or until cooked through. 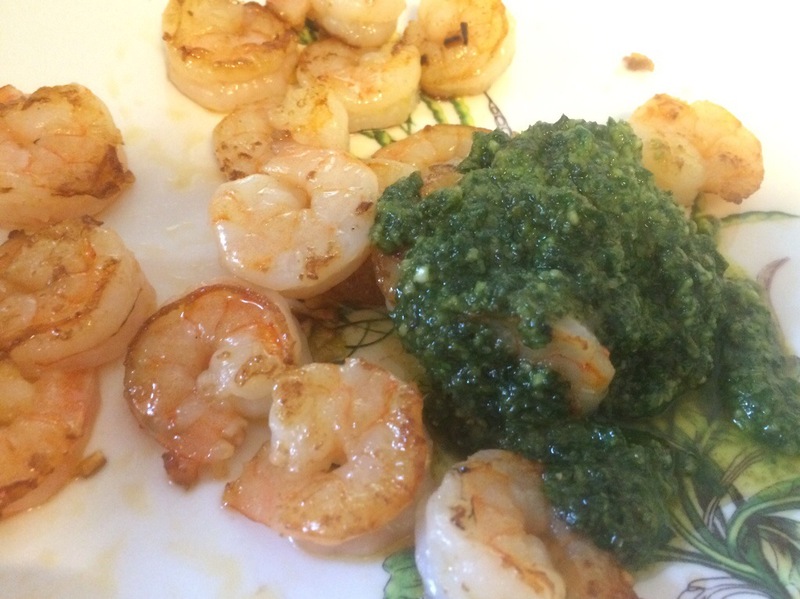 Put the shrimp and pesto into a large dish. Add the cooked pasta and tomato. Serve with freshly grated cheese. Enjoy! 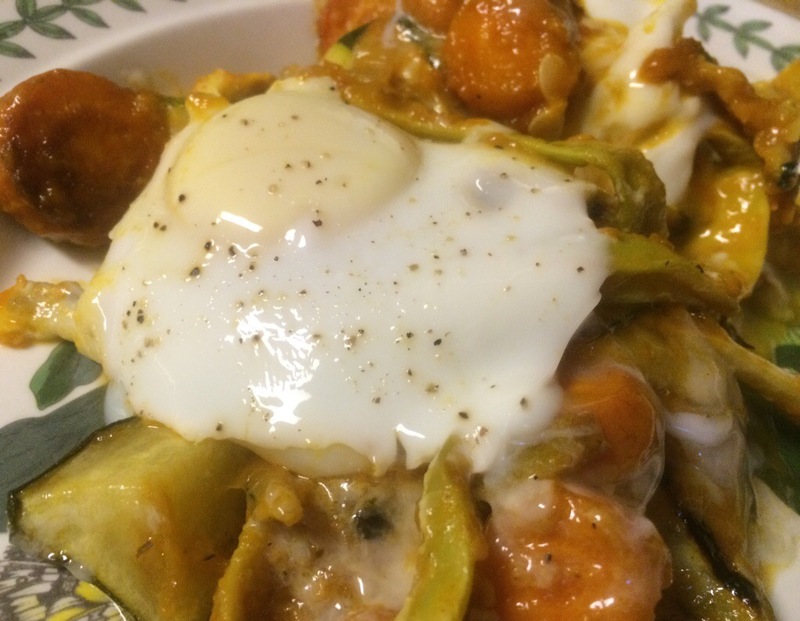 As I have said before, Khoresh Bademjun is pretty much the most popular meal in my household. 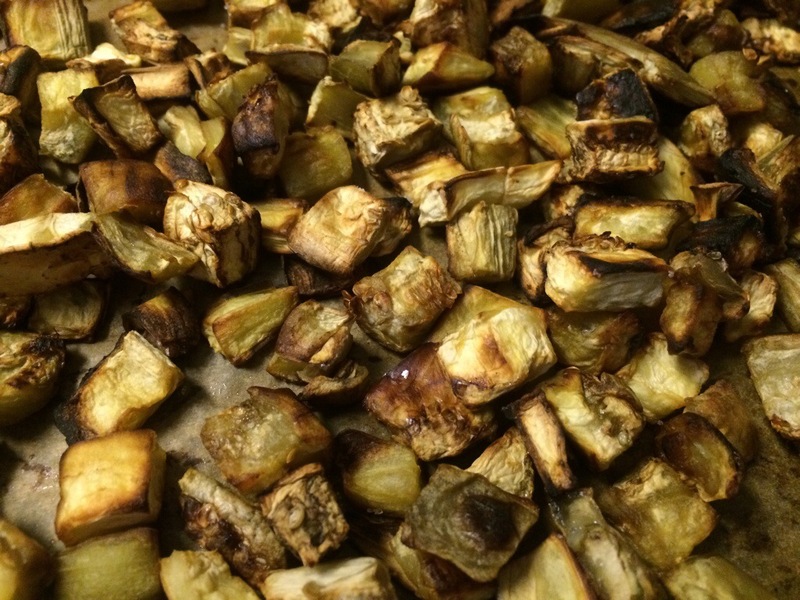 The only thing that keeps me from making it more often is all the oil used in frying the eggplant. So, when I made the Eggplant and Tomato Stew with Pomegranate Molasses and prepared the eggplant by roasting rather than frying, I was very happy when the eggplant came out tasting just as good as it did fried. I love fried eggplant, so this was quite a surprise to me. 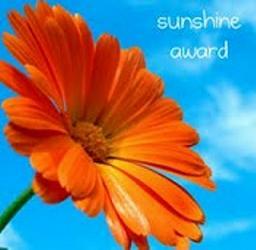 A pleasant one. So it was time to try the oven roasted approach to Khoresh Bademjun. The big test was my husband. He loves his Khoresh Bademjun. How would he like my new, healthier version? I am quite pleased to report that he said it tasted pretty much the same and that this approach was fine with him. Now we will get all the yummy goodness of eggplant without the oil. Strike one up for healthy eating!! Peel and dice the eggplant. Place on the baking sheet and drizzle with 1 Tbsp oil. Sprinkle with sea salt and black pepper. Bake for 40 minutes, stirring every 10 minutes. Remove from oven. Sonoma County, California… wine…food…sunshine…and good company. A perfect place to spend a long weekend. The grape vines were heavily laden with beautiful ripening grapes. The setting was perfect for some wine tasting. My friend, Debby, joined us as we headed off to Iron Horse Vineyards to taste their Russian Cuvee – which was served at the Reagan-Gorbachev Summit and at the White House since. As it goes with most wine tastings, different people liked different wines, and we laughed our way through our taste disagreements both here and at Russian River Vineyards. But, yes, we did all like the Russian Cuvee – probably the only one we all agreed on – no wonder it ended the Cold War. The afternoon of tastings was followed by a delicious dinner of locally grown and produced foods at Backyard in Forestville. Below was our pickle board appetizer with house fermented kimchi, preserved mustard seeds, pickled garlic (hey, I make that too! 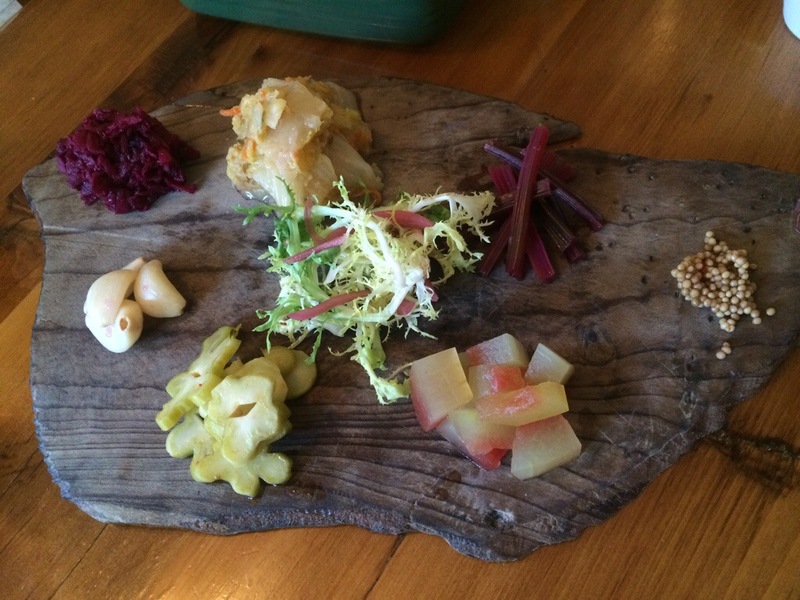 ), pickled broccoli stems and more. The food was excellent! 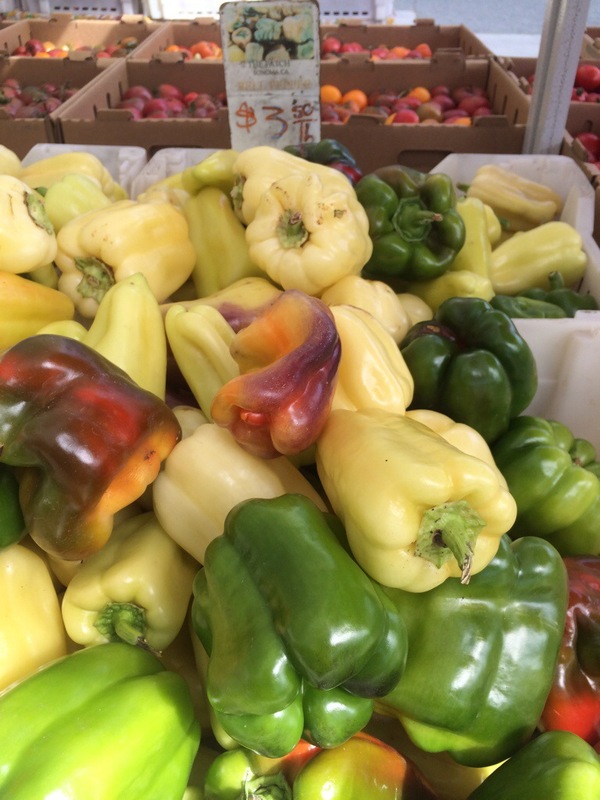 While my husband was busy, I spent my alone-time at the Sebastopol Farmers Market. What a selection of organic produce! 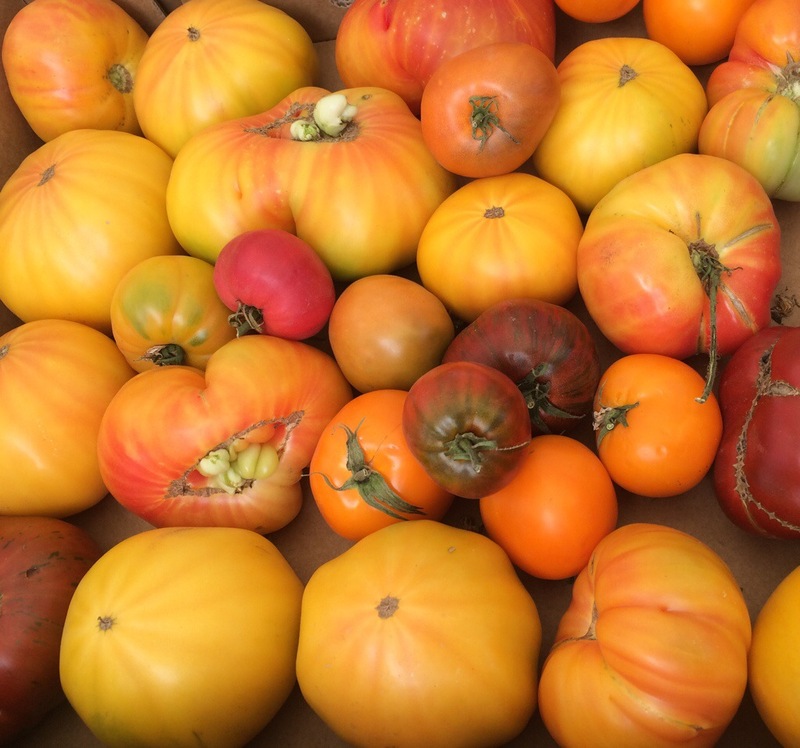 I was quite content among the tomatoes, pluots, dates, almonds, olives and more! After I met back up with my husband, we took our pluots and headed to the ocean for an afternoon of walking along the shore, watching the waves. 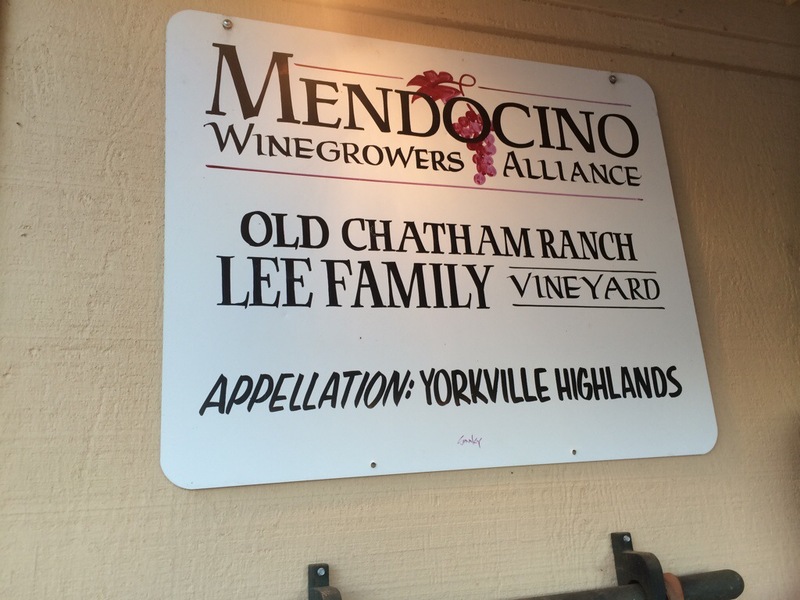 And, lastly, made it to our destination – dinner at a colleague’s parents vineyard and olive groves – Old Chatham Ranch in Mendocino County. 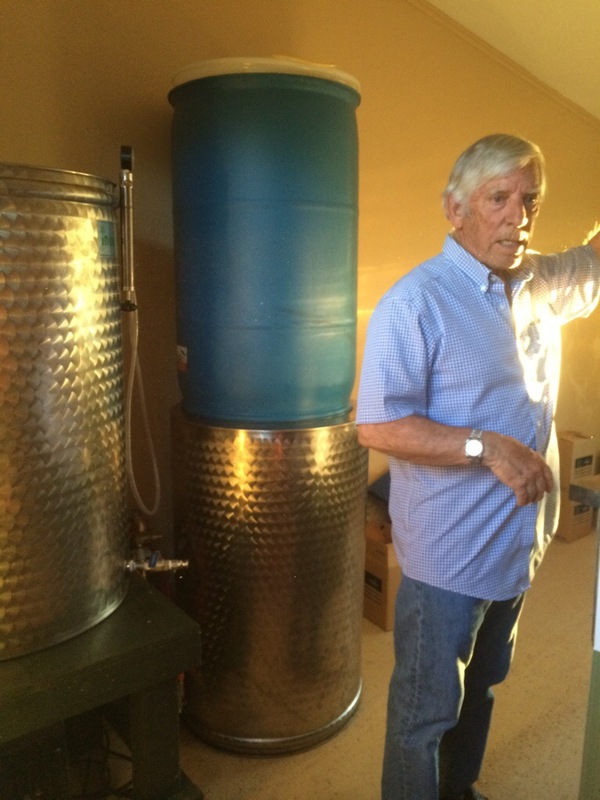 The family made some beautiful wines – the best we had tasted yet. But, alas, they only make wines for their own enjoyment. But what they specialize in is super high quality extra virgin olive oil. So, as you can imagine, dinner was a wonderful experience, as much for the company of this warm family as for the sumptuous food and drink. 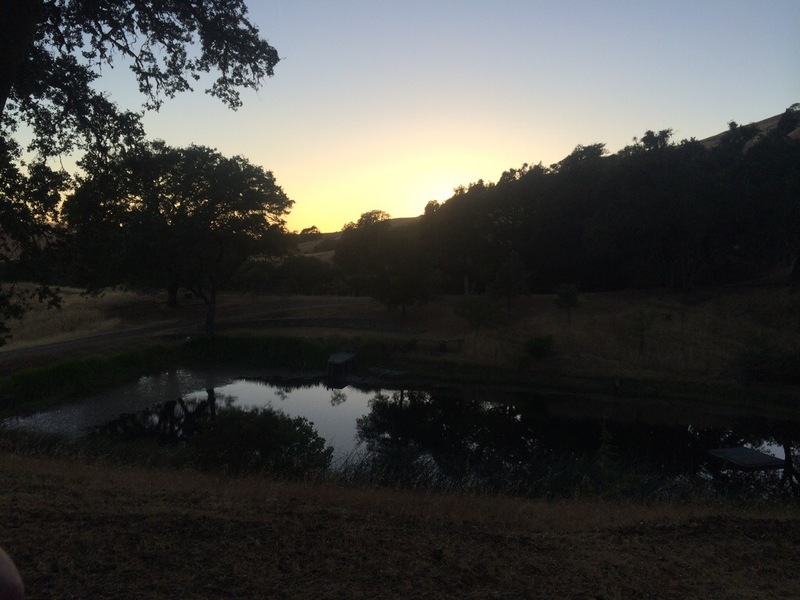 So, with that, we watched the sun set at the ranch and our weekend in Sonoma ended. We brought the wine home with us. I am anxiously awaiting my shipment of olive oil. This is not oil I will use for cooking, it is for dipping, special salad dressings, and as a finishing oil. I can’t wait, and I will fill you in on what I do with it. 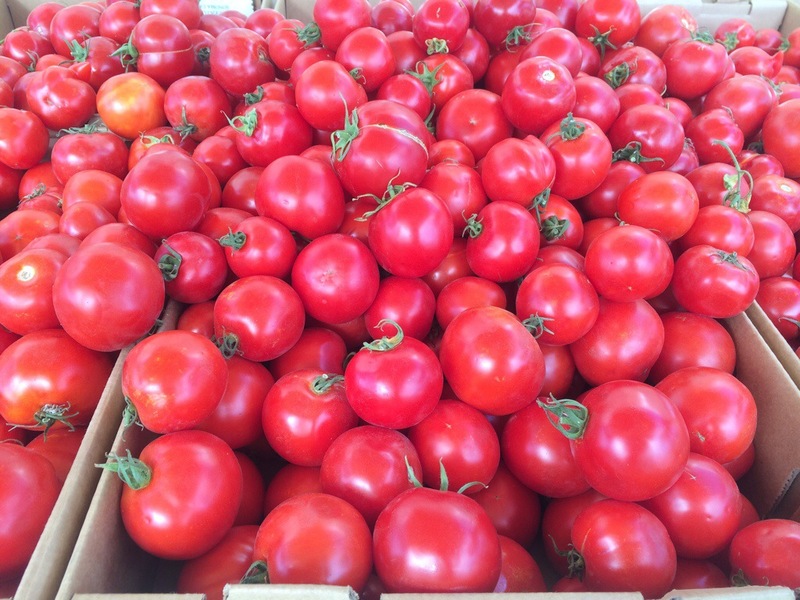 Tomatoes with a simple balsamic and olive oil dressing, or perhaps with truffle balsamic vinegar, or just making a good rustic bread and simply dipping it in the oil – oh I can’t wait!! My eggplant are not doing well this year, so I picked up some eggplants from Taproot Organic Farm at the farmers market. 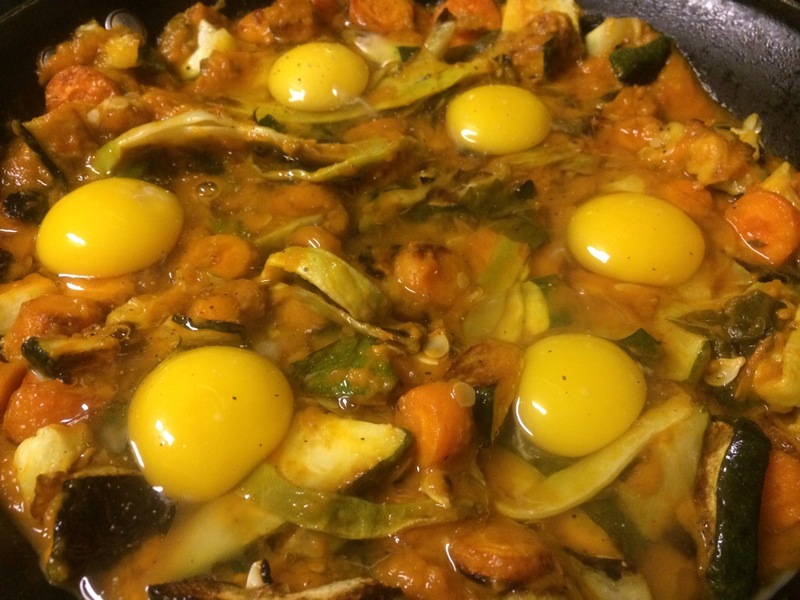 Now, typically, when I have eggplants I make Khoresh Bademjun (Persian Eggplant Stew). And when my husband heard that I was not making that, he was not happy. But I had seen the recipe for Eggplant and Tomato Stew with Pomegranate Molasses in Lousia Shafia’s The New Persian Kitchen and really wanted to try it. The ingredients that intrigued me were the split peas and the pomegranate molasses. I love the flavor the molasses brings to dishes and I thought pairing it with eggplant would make for a rich dish…and it did. The split peas added some texture to what otherwise would have been an entirely soft stew. But what I really wanted to try was roasting the eggplant instead of frying it. I was skeptical about that, but to my pleasant surprise, it worked great. I may even try that the next time I make Khoresh Bademjun. It makes the dish a whole lot healthier. S0 what was the verdict? 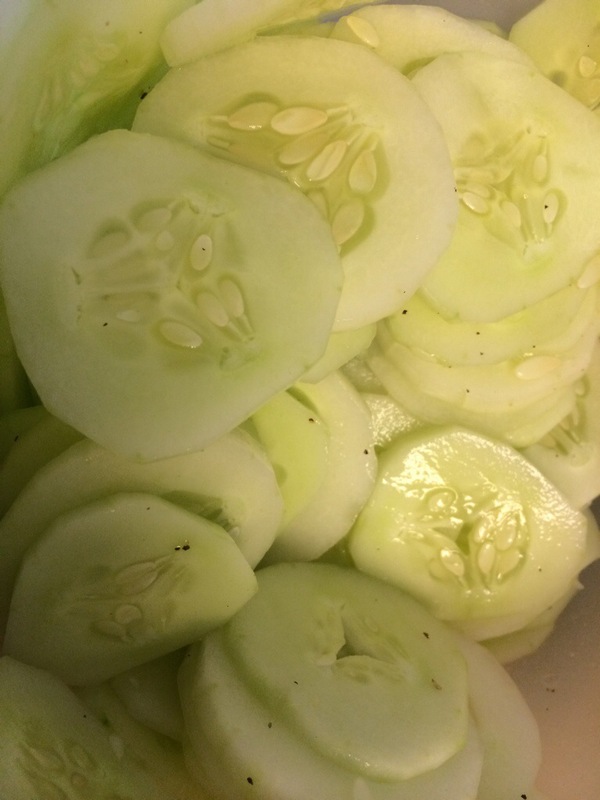 I served it with some vinegary cucumbers (see Cool Cucumber Salad – to be posted soon). My husband was happy with his dinner. Chalk one up for me! Spread the eggplant on the prepared baking sheet. 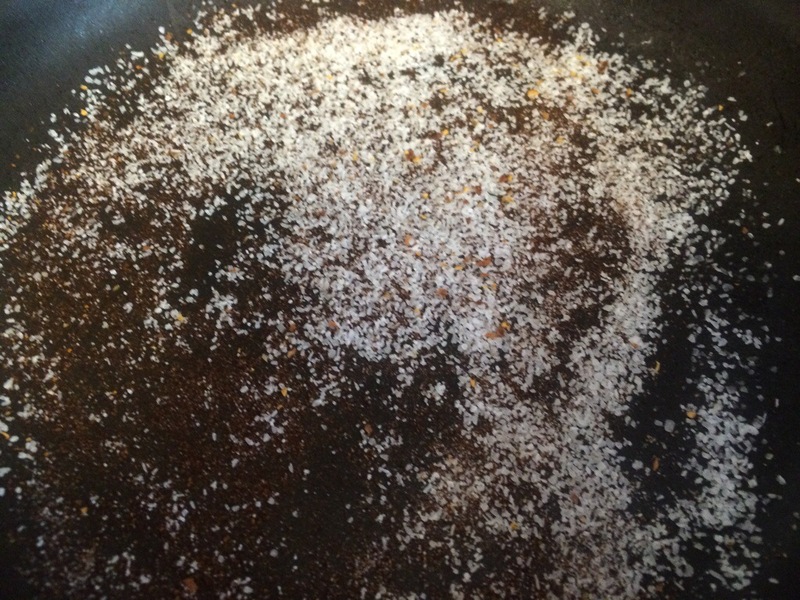 Sprinkle with 1 teaspoon salt and 1 tablespoon of the oil. Bake for 40 minutes, stirring gently every 10 minutes to prevent sticking. When the eggplant is completely soft, let it cool to room temperature. While the eggplant cooks, combine the split peas with the water in a saucepan. Bring to a boil, then turn down the heat and simmer, covered, for about 40 minutes, until the peas are tender. Drain and season with 1 teaspoon salt. Heat the remaining 4 tablespoons oil in a Dutch oven or a large, deep skillet over medium-high heat. Add the onion and cook for 10 minutes, until it starts to darken, then cook slowly over low heat for about 30 minutes, until it is dark brown and about half its original volume. Add the eggplant, tomatoes, turmeric, cinnamon, pomegranate molas- ses, garlic, split peas, and 1 teaspoon salt. Add the stock. Bring to a boil, then lower the heat and simmer, partially covered, for 1 hour. Uncover and simmer for 15 minutes, until the stew is thick. Turn off the heat and let the stew rest for 15 to 30 minutes. Season with salt and pepper and serve. Enjoy! Serves 4.